Below you will find some general forms that I made to make documentation easy. I have created a lot more, and have grouped them together in a packet that you can find in the shop. 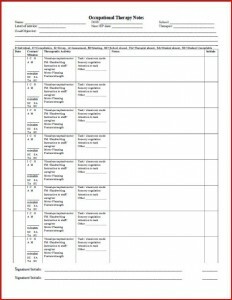 OT School Observations and Communication. 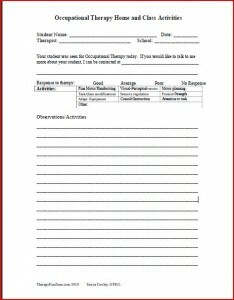 This form is used to write down what was done in therapy at school and send it home with the student so that the parents are up to date and informed on what is happening with therapy. Parents really appreciate it when they are kept informed, and this form has made it easier for me to keep that personal contact. I have printed them out on two part NCR paper so that I can send a copy to the parent and keep a copy in the chart. It really does make life easier. 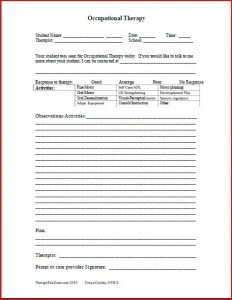 OT Services and Home Program Provided: This is a general form that I created to act similar to a SOAP note. 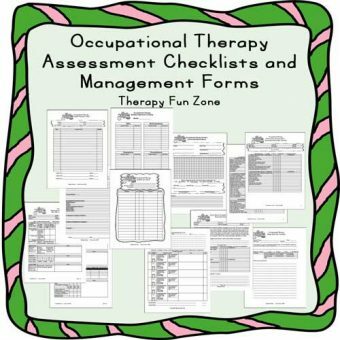 It provides all of the information I need about a treatment session, and I write out home activities that I would like them to do at each session. It is nice to have it all on one form. I have these printed on two part NCR paper as well so that a copy goes home with the parents/client, and a copy goes in the chart. 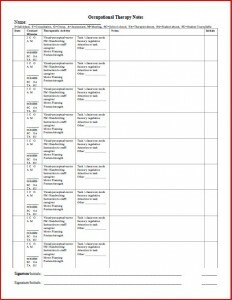 OT Progress Notes for school therapy: This is a form that I created to make it easier to keep track of progress, and write notes. It has gone through several revisions, and this is the current one. There is also a second page that does not have the goals on it.